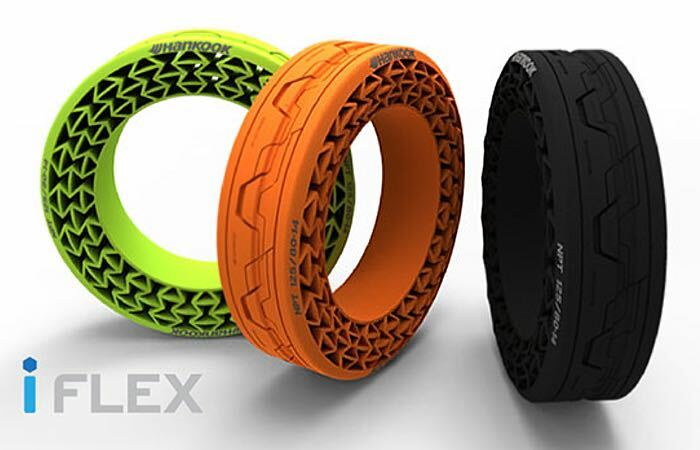 Tire manufacture Hankook has announced that testing is now complete on its high-speed Hankook iFlex airless tire that is constructed from eco-friendly materials. Indicating that the new next generation tire could be making it way on to consumer vehicles very soon. Airless tires or non-pneumatic tire (NPT) do not require air pressure to function and have been rigorously tested and pushed to their limits in five categories, that take the form of : durability, hardness, stability, slalom (zigzag) and speed. Hankook explains more about the tests they have been carried out on the airless tires to make sure they are ready for roll out to consumers. In the speed test, the electric car equipped with iFlex tires reached 130km/h. The impressive results in all five categories demonstrated that the NPTs could match conventional tires in terms of performance. At the same time, these results are expected to help the company solidify its position as a global top-tier tire company and, give new momentum to its future-oriented R&D capabilities. Construction of the iFlex is centered on a new type of uni-material designed to maximize the tire’s eco-friendly potential. From a manufacturing standpoint, the material used during product construction significantly enhances the energy efficiency. From a product standpoint, the material allows the iFlex to be recycled with greater ease. Hankook Tire then went one step further, integrating new tire construction techniques to simplify the manufacturing process from eight stages to just four, thus further reducing the company’s carbon footprint. Unfortunately no information on pricing or worldwide availability has been released as yet by Hankook, but as soon as information comes to light we will keep you updated as always. For more information on the new Hankook iFlex airless tires in the mean time, jump over to the Hankook press release website for details via the link below.